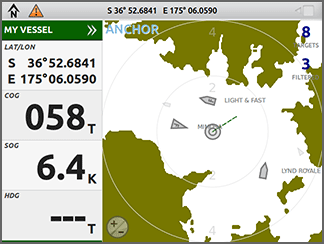 Use the GPS mode button to split the screen and place your GPS position, course and speed on the left with the AIS plotter on the right. Even when you don't have the GPS split screen showing, you'll find your position displayed in the status bar at the top of the screen. You can change the status bar to display your course and speed if you prefer by selecting Show COG/SOG from the WatchMate Wheel.